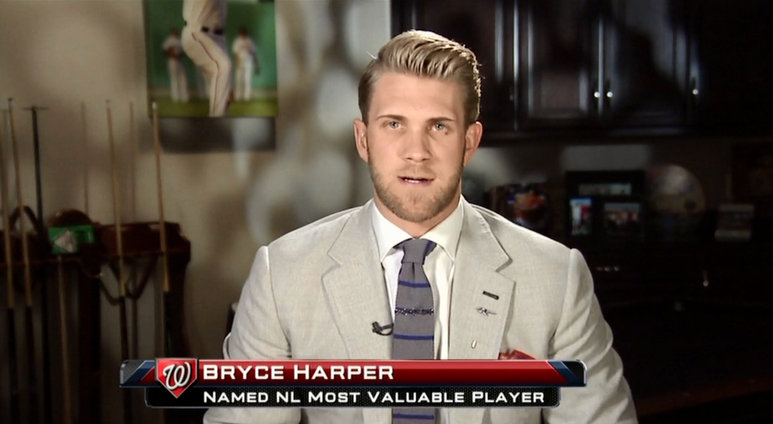 After a historic 2015 season, Bryce Harper was unanimously selected as the National League MVP on Thursday evening. He became the second former Harrisburg Senator in the modern era to claim the award after Vladimir Guerrero took home the American League honors in 2004. This entry was posted in Uncategorized and tagged Brandon Phillips, Bryce Harper, Chris Young, Cliff Lee, Cy Young, Gold Glove, Harrisburg Senators, Ian Desmond, Jeff Bannister, Jim Tracy, Mark Grudzielanek, Michael Barrett, Moises Alou, Most Valuable Player, Orlando Cabrera, Rookie of the Year, Ryan Zimmerman, Silver Slugger, Stephen Strasburg, Vladimir Guerrero. Bookmark the permalink.